What kind of bars can I expect to find on a cruise ship? Most large cruise ships will have multiple bars, with themes ranging from Caribbean and disco to martini and dueling pianos. Some will be just a place to grab a drink and go; others are onboard destinations with entertainment or lounge areas for chatting with friends over drinks. 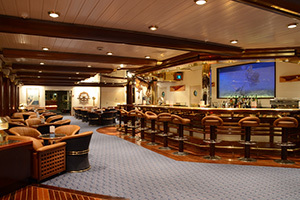 Even the small ships usually have a lounge with a bar where passengers gather before and after dinner. Are cruise ship bars open day and night? Cruise ships make it easy for you to buy drinks at all hours; on most large cruise ships, you can start with Bloody Marys and mimosas in the morning, move on to fruity drinks by the pool, grab pre-dinner martinis and finish up your night with an Irish coffee. That being said, not all bars are open all the time. Your cruise daily bulletin will list the hours that each bar is open, as well as drink specials. Do the bars ever get crowded? With so many bars onboard large cruise ships, it's a wonder that any bar feels crowded. But some venues do tend to be more popular than others. 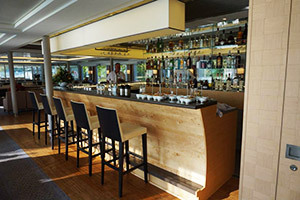 Martini bars, for example, tend to fill up before dinner, as do any bars that are located close to the main dining room. On a hot sunny day, the pool bars can also get slammed with orders. Meanwhile, piano bars are universally popular and can be crowded after dinner. What kind of alcohol is served in the bar? If I'm particular about my liquor brand or craft cocktail, will I be able to get whatever I like onboard? Cruise ships serve a wide variety of alcoholic drinks, from beer and wine to martinis and the fruity pina coladas and daiquiris that are synonymous with the Caribbean. For drinkers who prefer top-shelf brands, most ship bars do carry a variety. To find out what brands of liquor are on your ship, check your cruise line's website, or ask other passengers in the Cruise Critic forums. 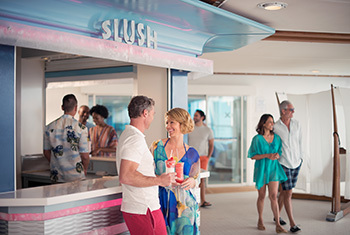 Keep in mind that, while cruise ships try to keep up with current bar trends, they are serving drinks to a wide range of people. So even if the ship has a craft cocktail bar, you might not be able to get a drink with shaken egg whites in it or find spiced pumpkin vodka. How much are the drinks? Are they the same price that you'd pay on land? Alcoholic drinks onboard cost about the same as you'd pay on land, depending on which line you're sailing with. An upscale lounge serving craft cocktails and martinis might charge $12 to $13 for a drink, while beer and house wine is usually between $4 and $8. You'll pay more for craft beer and premium vintages. On many river cruise ships and luxury lines, some or all alcohol is included in your fare. Do the bars serve soda and water? What about nonalcoholic drinks? Yes. Prices for soda are similar to what you'd pay in a restaurant on land. Tap water is free, but bottled water will cost a little more than what you'd pay in a convenience store. Most cruise ship bars also sell nonalcoholic versions of fruity drink favorites, such as virgin daiquiris. Drink packages can be purchased before or on the first or second day of your sailing. They come in different varieties for things like soda, bottled water and smoothies and often offer a cost savings over per-drink prices for those who regularly indulge. Do I pay cash for my drinks? Nope. All bar purchases are tied to your onboard account, which is accessible through your keycard. When you order, bartenders will swipe your card to add the charges to your account, and have you sign a slip. (If you have an all-inclusive drink package, you'll skip the signing). Do I tip the bartenders on a cruise? On most cruise ships, the gratuity is automatically added to your drink price. The amount depends on the line, ranging from 12 to 18 percent. And, yes, you'll have to pay the gratuity on sodas, too. The included gratuity doesn't mean that you can't tip more. Some cruise regulars tip the bartender in their favorite hangout when the cruise first starts so they can get better service throughout the trip. Your results may vary. Is there a limit to how much you can order? You can buy more than one drink at a time; you'll be asked to sign for the purchase after you order. (If you have a drinks package, however, you'll only be able to get one drink per keycard to prevent people from getting "free" drinks for friends. There might also be a limit on the dollar amount of each drink or a daily drink maximum, depending on the package you purchase.) Bartenders also reserve the right to stop serving patrons who are visibly intoxicated or out of control. Can I bring my own drinks to the bar? No. While most cruise ships allow you to bring one or two bottles of wine onboard (after paying a per-bottle corkage fee), you can only drink it in your cabin or in a restaurant, not in the bar or public places. Do I have to stay at the bar to finish my drink? No. Think of a cruise ship as similar to New Orleans, where you're allowed to carry your drink in public areas, from bar to bar, from the bar to a restaurant or from a bar to your room. Can I keep the glass? No, unless you buy a specific souvenir glass. What's the drinking age in the bars? All cruise ships run by U.S. companies abide by the American drinking age of 21. European lines, such as Costa and MSC, also maintain the age of 21 when they are leaving the U.S., but they lower the drinking age to 18 on vessels leaving from non-U.S. ports. That doesn't mean that people younger than 21 can't enter the bar. Many bars are used during the day for activities like trivia or crafts. Even before dinner, families can sit together in a bar. Those under age simply won't be able to order alcoholic drinks. Will I get carded at the bars? Remember the cabin keycard we mentioned earlier? If you're younger than 21, it will either be a different color or have a different code, so it's almost impossible to fool your bartender. This also means, unfortunately, that you won't get to feel flattered when the bartender asks for your ID! Can I smoke in the bars? As ships tighten up their smoking policies, it's getting harder to find bars onboard where you can smoke. On some ships, the lines will set aside a bar, usually with an outdoor space, for cruisers to light up; you'll find the European lines are more lax with their smoking rules than the U.S. ones. Still other ships have special cigar bars. One place where you are likely to be able to puff while you imbibe is the casino (except on Celebrity, where the casino is smoke-free). How can I learn more about cruise ship bars?